O Prince, among the Pancha Tirthi (set of five Tirthas) is exceedingly excellent. By the holy ablution therein a man can well forget further stay in the womb. 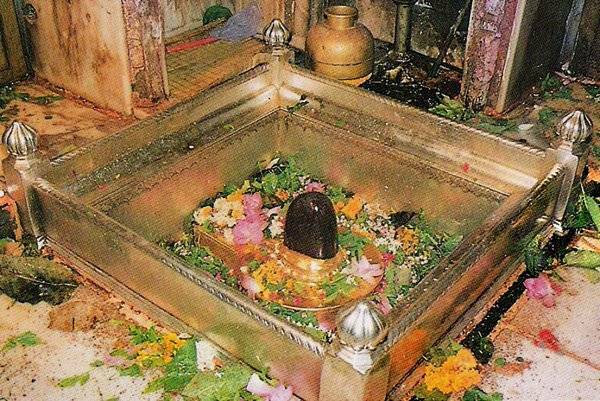 The first one is the confluence of Asi (with the Ganga), the greatest and most excellent one among the T$rthas is called Dashashvamedha which is resorted to by all the Tirthas. 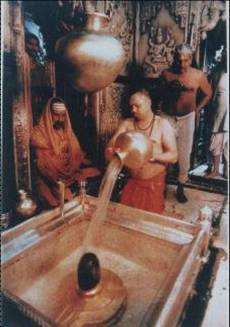 There is the Padodaka T$rtha in the vicinity of adikeshava; then is the meritorious Panchanada (Panchaga%ga) which removes mass of sins by the ablution. O highly excellent one, apart from these four Tirthas the fifth one named Manikarnika accords the purity of the mind and the limbs.... By taking the holy bath in Panchatirthi a man ceases to take up the body of the five elements. Or he becomes Panchasya (the five-faced Lord himself)." Linga Purana IV.ii107-10,114. 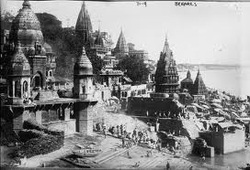 •Pilgrims follow a the pilgrimage route similar that Shiva himself is said to have performed when he came to Kashi seeking expiation from the horrible sin of cutting off Brahm@'s head. 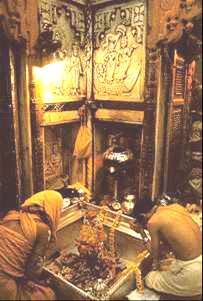 He is said to have gone to Lolarka (Asi Ghat), Keshava, and then to Manikarnika where the head which was stuck to his hand finally fell off. 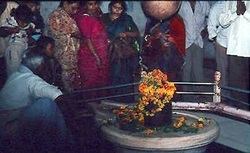 •This entire city is the JyotirLinga (the linga of Light).